What are the most important things to look for when selecting a contractor for my roofing project? You should always check how long the company has been in business as well as verify their licenses. Hiring an unlicensed roofing contractor could be costly in the long run. You should also check their standing with the Better Business Bureau and the Arizona Registrar of Contractors. A company with a long history and no complaints is usually a safe choice! I really liked the first company that provided me with an estimate. Should I bother getting another estimate? Yes, unless it was us then you can stop there. Just Kidding… It is always a good idea to get more than one estimate from a reputable company, three is a good rule of thumb. When getting multiple bids make sure everyone is bidding the same thing, ask questions such as what underlayment they are using, manufacturer of product they are quoting or certified to install. Compare workmanship warranties and read the exclusions. Many roofing companies give you a price, wait for you to accept, and then give you the contract revealing their exclusions, which make the warranty worthless. Don’t just take the lowest bid, ask questions and find out what it is that you are paying for. What is the approximate price of a new roof? Your neighbor’s roofing costs could be a different than yours even your homes are identical. Every roof has different conditions such a debris, flashings, cracked tiles that may need to be replaced, etc. We can give you a ball park but it is impossible to give you a close number due to all the different variables that need to be seen by a qualified estimator. Things such as roof pitch, substandard or rotted wood, what is currently on the roof like air conditioners, solar panels, etc. How long does it take JBS to complete a roof replacement project? There are multiple variables on how long it takes to complete a house from start to finish; size, roof pitch, product being installed, access to the roof, does the roof have a lot of angles and weather? This question could best be answered when the contractor comes out and inspects your roof and provides a bid. Most standard size houses are completed in 3 days but again this could very based on your roofs uniqueness. The estimator can give you a better idea upon inspection. Is there anything I can do to prepare my home for the installation of a new roof? Great question! During the removal phase: Keep the drive way clear to allow for the dump trailer. Put newspaper down on the floor at the locations of any vents, such as bathroom fans and stove vents. This will protect your floors from dust that may have collected in your duct work over the years. Things don’t normally vibrate off of the walls but if you have any valuable family heirlooms you may want to remove them. Again this depends on the roof system that you choose it can be anywhere from 5-25 years. This is a great question to ask the estimator when they give you the proposal, especially when getting multiple estimates. Foam will last an extremely long time if properly maintained and recoated every 5 years. Shingles typically last 20 years in the heat of the Valley of the Sun, but if there are conditions that increase wear and tear on your roof such as bird and tree debris, it will shorten the life span of your roof. Tile roofs typically last 30 years but it varies based on the type of underlayment used and how many layers were applied. How can I tell if my roof needs to replaced versus just needing to be repaired? On a tile roof it is extremely hard to tell unless you are having multiple leaks in different areas of the house. If you are experiencing multiple leaks it is a good indication that the underlayment has either reached its life or that it was installed incorrectly. Shingle roofs will have granule loss over multiple areas of the roof. You may also find pieces of the shingles on the ground after a windy day, this is due to the shingles being brittle and breaking off. Flat roofs with a foam and coatings, you will start to see the foam exposed through the coating. Once the foam has been exposed to the sun it will need to be ground down or tore off depending on how brittle the foam is. Sometimes you need to replace your roof as soon as possible because it is causing damage to your home each time it rains. However, if you are being proactive and replacing the roof before it becomes an emergency, then, depending on your roofing system, you may want to replace it during an optimal time. Tile roofs have no good or bad time, they can be replaced during any season. Foam is best applied when it isn’t humid or on cold days, which is perfect for our Arizona climate. The hot sun doesn’t affect the foam cure time but it does need to be coated within 24 hours after applied or sooner on extremely hot days. Foam cannot be sprayed in the wind or if there is rain. On the rare occasion we have an extremely humid day, we may need to reschedule your foam roof instillation. Shingles can be replaced any season but in the hot summer months of July and August they may only be installed for a few hours in the morning. The heat of our sun can make the shingles soft, which makes it difficult to work with in the afternoon. They can still be installed but the crews generally start as early as the noise ordinance allows and then stops around lunch time. My roof was damaged by a Monsoon and I'm not sure what to do. Do you work with my insurance company? What is the proper procedure to follow? We will be happy to work with your insurance company and even contact them directly for you once your initial claim has been made. Under normal circumstances if you think just your roof was damaged you can contact a roofing company and we will inspect the roof for damage and let you know if you should contact your Insurance company. We will also provide you with a report to give them of the damage we found. If there was a large storm where a lot of damage has occurred throughout the city, I would contact your insurance company right away so you can get on their waiting list. 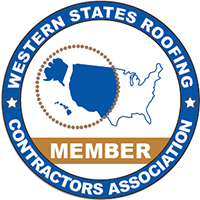 For more information about Energy Star roofing products, please visit their website.